What is the IP telephony service? 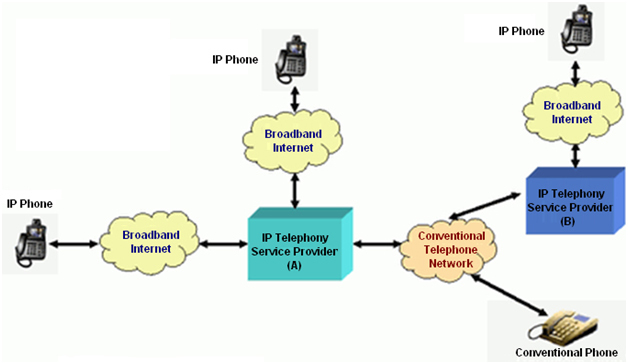 As illustrated below, users can make an IP telephony call through a broadband connection to another person using the conventional telephone network or an IP telephony service, and vice versa. What are class-1 and class-2 IP telephony services? There are two classes of IP telephony service in Hong Kong, namely class-1 service and class-2 service. The class-1 service is an IP telephony service that has all the attributes of a conventional telephone service. Telephone numbers under the class-1 service have eight digits, and have the number '2' or '3' as a prefix, which are similar to the numbers for a conventional telephone service. The class-2 service is an IP telephony service that does not have all the attributes of a conventional telephone service. Telephone numbers under the class-2 service also have eight digits, but they have "57" or "58" as their prefix to distinguish them from the class-1 service. Furthermore, class-2 service providers must declare that their IP telephony service is a class-2 service. Class-2 service providers are not obliged to provide the following. Number portability – users switching from the conventional phone service, or the class-1 IP telephony service, to the class-2 IP telephony service, will have to use a new telephone number. They cannot use their current numbers. Moreover, class-2 service users switching to any other service providers (including other class-2 service providers) cannot keep their current numbers. Telephone directory-enquiry service and printed directory-enquiry service – while class-2 service providers are not obliged to provide these services, they may choose to do so on a voluntary basis. What service features are both class-1 and class-2 service providers obliged to supply to customers? provide a backup power supply to "lifeline device" users if IP telephony services are offered to them. Number portability is supported by the class-1 service only, but not by the class-2 service. In other words, you can keep your current telephone number when you switch from a conventional telephone service to the class-1 service, and vice versa. Your current telephone number can remain the same even if you switch between different service providers of the class-1 service. You cannot keep your current telephone number if you switch from a conventional telephone service, or the class-1 service, to the class-2 service. Moreover, class-2 service users switching to any other service providers (including other class-2 service providers) cannot keep their current numbers. Unlike the conventional telephone service, for which electric power is supplied over the telephone line, the equipment that is installed at the customer’s premises to support the IP telephony service, such as broadband modems, IP phones, adaptors and computers, all rely on electric power to run. Before you subscribe to an IP telephony service, please check with the service provider whether it will provide a backup power supply to your telephone set and other related equipment at your premises. Users of "lifeline devices" should not subscribe to services that do not provide a backup power supply. Users of an IP telephony service are advised to keep a mobile phone for communication during a power blackout. When you make an emergency call, your call location is a critical piece of information. IP telephony service providers are required to provide the means for you to update your address with your IP telephony devices whenever you move home or office. You should check the availability of this service with your service provider. You should also update your address immediately after you have moved. Some IP telephony service providers offer service packages at very attractive prices. Some service plans allow users to make long-distance calls free of charge. You should always clarify with your service provider whether there are restrictions on free long-distance calls, whether paid calls are charged on a flat rate or call-duration basis, and whether there is a concession period during the day. Before committing to a telecommunications service contract, you should carefully study the information described in any leaflets/advertisements/application form/service contract about the service. You should check whether you are required to sign a fixed-term service contract which will bind you to the service for a fixed period of time. This is important because, during the term of the contract, if, for whatever reason, you wish to cancel the contract, you may have to bear a penalty or not be able to get a refund of the money that you have already paid to the service provider. This may happen because some IP telephony service providers can only provide their services using the service platforms of certain broadband service providers. Also, you will have a problem if, during the term of the contract, you have to move to a new apartment at a location that is not served by these broadband service providers. You have to assess whether there is a possibility that one of your family members may need the "lifeline" service later. If yes, you will need to confirm the availability of a backup power supply with the service provider before signing a long-term contract. The telephone services offered by the existing fixed-network operators are no longer limited to conventional telephone services. They may also provide either a class-1 or a class-2 IP telephony service. Always check with the service providers on the types of telephone service that they offer.